Our wide range of distinct cheeses are available as whole, half and perfectly portioned as carry-out purchases for all deli counters. Approximate weights 180 – 200g packaged in vacuumed waxed paper for maximum shelf life. 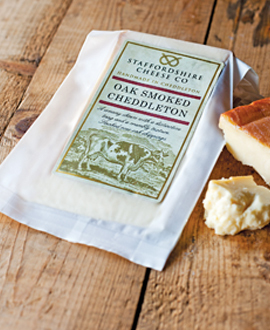 Flavour and texture may vary slightly dependant upon the maturity of the individual cheeses. 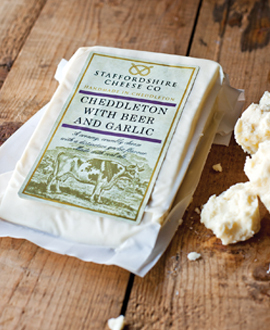 Staffordshire Cheese curds gently pressed in a muslin cloth-lined mould, to give a crumbly, semi-hard cheese with a fresh creamy taste and a hint of citrus. 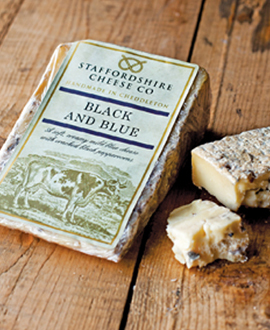 Our bestselling, mild, soft, creamy blue cheese. Served at room temperature this delicious blue practically melts in your mouth. 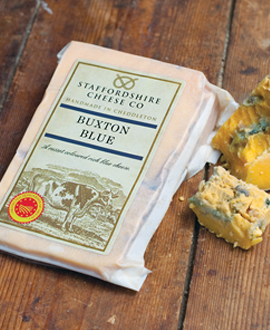 We call this ‘blue for beginners’ as the texture is so special you almost forget its blue. 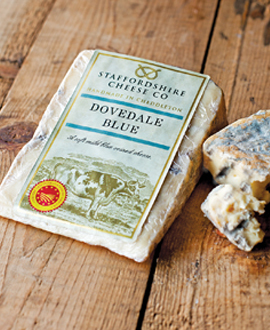 A fantastic blue cheese with a powerful tangy kick. We use annatto to give this cheese its gorgeous rustic glow. A truly traditional tasting cheese made using unpasteurised milk from local farms with the addition of a liquid mother culture. 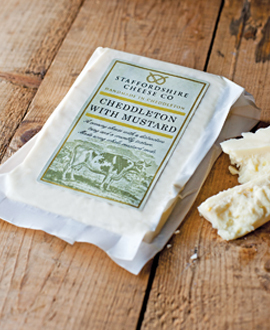 This hard cheese has a distinctive full bodied flavour. 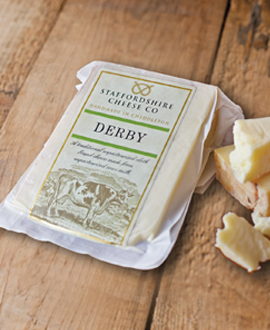 Our beautiful Dovedale cheese is blended with a high quality cracked black pepper to give a warming kick. Perfect for on top of a steak or burger. 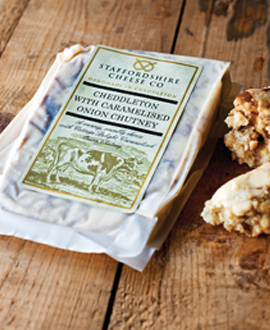 With the original as its base, we blend in Cottage Delight Caramelised Onion Chutney, giving the cheese a fantastic marbled appearance, with a subtly sweet finish from the balsamic vinegar within the chutney. This cheese is perfect to start off any cheese board, citrusy and refreshing, it cleanses the palette and has a fantastic crumbly texture. We gently wash our matured original in a unique blend of garlic and our sister company’s Double Sunset Ale, giving a citrusy cheese with a flavour that is sure to please all garlic lovers. 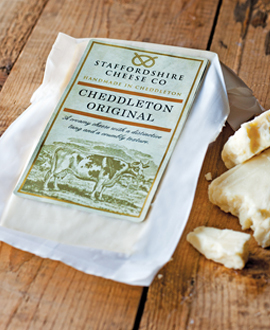 We add a high quality, dried chilli flake to our Cheddleton Original. 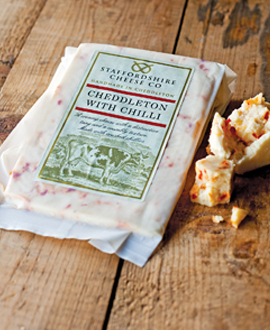 This cheese has a high level of heat that’s certain to please all chilli lovers, without compromising on flavour. With a blend of both whole and split mustard seeds, this cheese covers taste and texture in one hit. The split seeds release the mustard flavour in to the cheese, while the whole seeds give a good crunch to every bite. 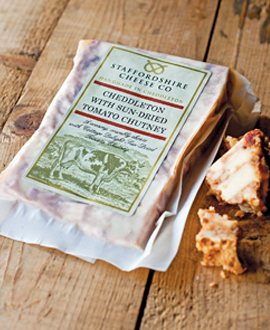 Using the original as its base, we blend in Cottage Delight Sun-Dried Tomato Chutney, giving a marbled appearance whilst adding a gentle heat from the chilli and garlic in the chutney. 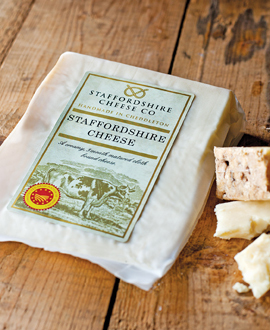 Once our Staffordshire Cheese has hit two months of age we send it away to an award winning smokehouse, where each Cheese is gently smoked over a unique blend of oak and beech chippings.